In an interview with Asian Age, Mastermind Deepak RAO speaks to Anjou Giri on 9th Oct. 2003.
one needs to be patient, observant, astute and sharp. It's nothing to do with acquired power, as people assume." He can.... With his mind.... Bend your Key.... Read your Mind.... Stop your Watch.... Levitate Objects.... All under your nose ! 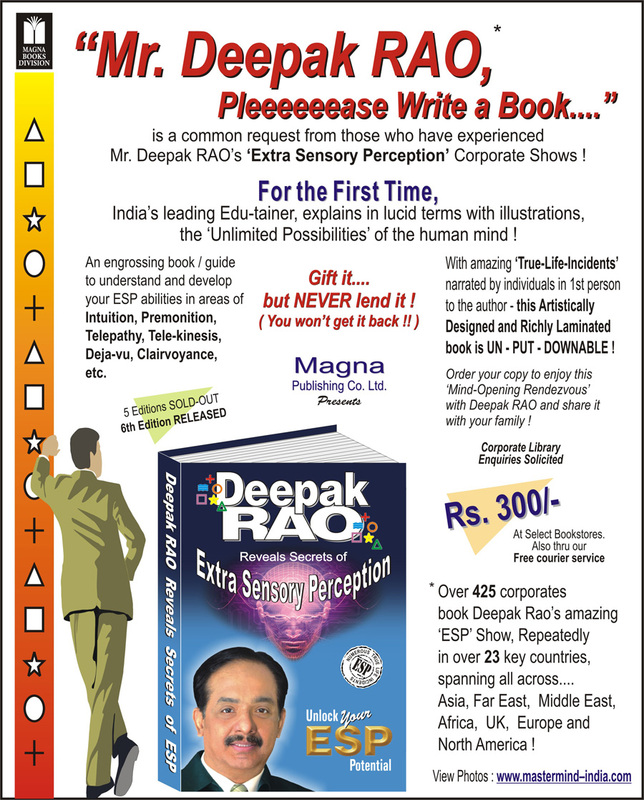 Master of psycho kinesis Deepak RAO, calls it edu-tainment while insisting that most people use only 5 to 15% of their mental abilities, whilst some use 15 to 25%. Off late, he has also been getting enquiries to conduct Training Sessions. RAO has been keeping low profile, while presenting his shows to corporates since 1991. The man is tall. He has dark eyes, NOT so hypnotic as one would think, but they have a piercing expression, reading the visitor’s expressions and body language. “I was taught lessons on how to harness my mental capacities by my uncle when I was 11 years old. These disciplines are not easy to follow, it requires immense patience and determination,” he explains. He asks for a fork, checks it and asks me to check it as well. He then sits cross legged on the floor of his cabin, throws the fork in front of him and then waves his hand in front of it. Then he puts both his hands on his temple, concentrates hard. The fork moves as if a gust of wind had blown it and subsequently revolves like a spinning top. He takes my right hand, places the key on it, puts his hand on top covering the key. Then I am asked to place my left hand on top of his hand. RAO then concentrates hard, so hard, his body trembles, the trembling is like when using physical force. Voila ! The key lies bent in my hand. Deepak RAO however, likes to maintain that this ability can be honed by anyone and it’s not God-gifted. He says the concept of God is for the weak minded. And that’s exactly he promulgates with his ‘ESP’ Show by which he entertains his corporate clientele. He is a highly sought after entertainer in the corporate world. It’s not just about mind boggling shows.... but also thought provoking shows. “I started taking this seriously as an alternative career only after 2002, where I started presenting shows to corporates,” says RAO. Today, he is recognised as India’s answer to Uri Geller and is the only sought after entertainer in the country.